"Yes Indeed There Is a Heaven, Just Ask the Dog"
On the Cove Beach as heavenly rays blast through an ominous cloud formation. 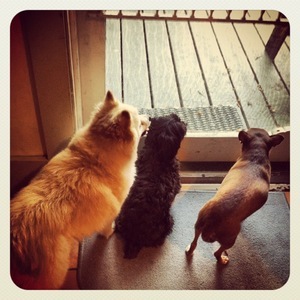 We grew up with dogs in our home and know how much joy and love they can add to a family dynamic. Many times our family travels included Makapu, Bimini or Maitai joining in on a family vacation or road trip. For one such trip, we travelled all the way down to Sanibel Island, FL in a Datsun B210 station wagon with our family of 5, a baby sitter and Bimini (the first dog on the planet that could chase down a frisbee and catch in mid-air). It's incredible to think we made that trip crammed into that little car (do families still travel like that)? Rugged trio waiting on the bar-b-que. So we know first hand that being able to bring the family dog on vacation can be an important consideration, if not a deal breaker at times. When your Cape May vacation planning hits the calendar, having the option to bring your dog for a family vacation can sometimes be an important consideration on where you stay. Our house has a back and front yard so you can walk your dog, and take care of business there too. Sunset beach at Cape May Point has a beach that is dog friendly certain times of the year. There's fenced off dog park 2 blocks away so if you really need to have your dog socialize, this is an option (though there is fee and registration required). That second point is pretty cool; it can be a lot of fun to take your dog to Sunset Beach, or one of the other dog friendly beaches, for a run or walk with the family. If you pick your times strategically you can have the beach to yourselves. Just make sure to follow the city guidelines on dog rules, and double check on the time of year they allow it (it's been known to change) and you'll be ok. It's difficult to find Cape May vacation home rentals that allow dogs. Most home owners just do not want to deal with the hassle. We added this as an option because we know how much it can add to a family experience, but also for practical reasons as we know it opens up another market for us. We do have specific requirements to make sure our house and neighborhood are safe and clean and that your dog is not going to disrupt the neighborhood, but that's a given. I love this shot. 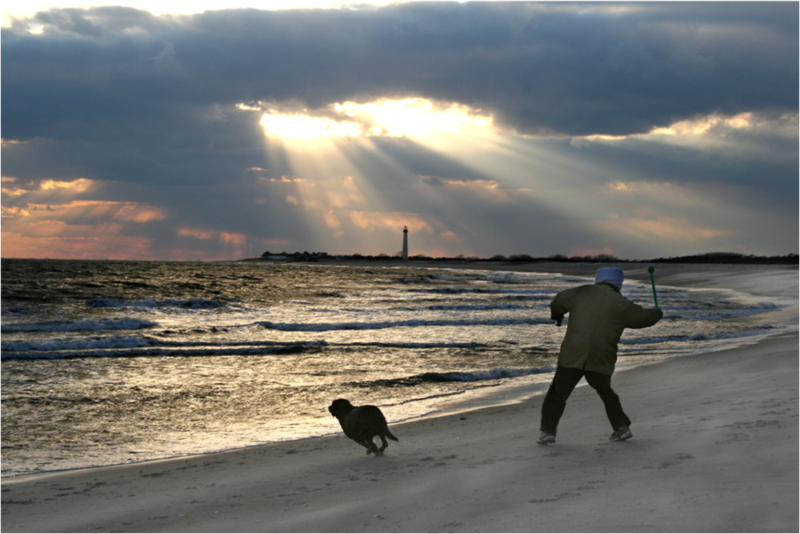 A pet and his owner taking in the best of what Cape May has to offer. The next time you're planning your Cape May family vacation, and want to bring your furriest of family members, do think of the Longfellow Guest House. For more details about our dog policy and requirements, and to see if your dog is on our insurance acceptable list, please visit our Longfellow House Dog Policy page. And if you still have questions, don't hesitate to Woof! Posted on March 12, 2013 by Michael Longfellow and filed under Vacation Value, Accommodation Research and tagged Dog Friendly Dog family.